Yeehaw! 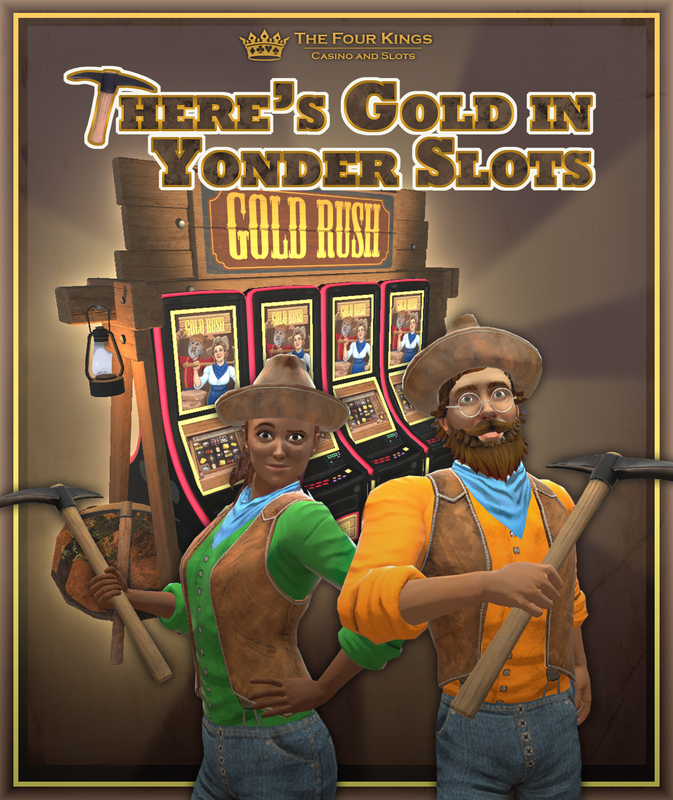 The ol' prospector has discovered gold in yonder slots! Saddle the horses and load up yer wagon, now's the time to strike it rich! A brand new slot machine is available now throughout the casino! In Gold Rush, when you earn a bonus round you can instead choose to move to the next dig site on the map for a chance at a bigger jackpot. How far will you go before digging for the big payout? A unique bonus round feature: When you get 3 bonus symbols, instead of beginning the Gold Rush bonus round immediately you can instead choose to move to the next new dig site and a higher jackpot. Progress through the map for even bigger jackpots. Exclusive new themed rewards! Completing the new reward tasks by winning jackpots and getting further on the map to earn yourself a Pickaxe and the three pieces of the Prospector outfit. Three new achievements available to earn by completing tasks in Gold Rush. Seriously? Come on guys, you cant give out better prizes? I'm sorry but no one wants to dress this way unless they are trolling. I'm really disappointed. Ewwwwww, no young woman or guy wants to dress in dirty old miner clothes. You couldn't have given out a pet maybe, like a horse? It's about time they put out something that doesn't reveal everything you got. I'm young, but I don't agree to this. It's suppose to be for fun, so why not? You don't have to wear it, there's plenty of other revealing enough clothing in game already you can wear. Not everyone, young or old, man or woman, want to wear revealing clothing. We should be thanking them just for putting out a new game. I never said it had to be revealing lol, the clothes are pretty ugly -_- I'd say that at least half the clothes are old lady looking, like stuff my grandma would wear. My apologies, even so, it's suppose to be for fun. lol I think it's cute. Everyone has a right to their opinion. Personally I don't see it being fair to the developers who worked on designing the outfit for the game, to judge it like that. I feel it fits perfectly with the new slots. One thing I agree with you on, is it would be nice to see rewards that are companions sometime. The new slots based off the wild wild west are very nice and all..
..but how about bringing back and adding the Western Frontier space instead? Ya know the saloon space you had on PlayStation Home? Maybe as a personal space with a pick axe mini-game of sorts? Just a suggestion, would really to see this brought back. I think this is an excellent idea. Its about time a new space was added. I would also suggest (yet again) that with the ever growing catalog of slots they need their own room as well. Game is fun any idea how to get the trophies though? I got the one where you move on the map instead of doing the bonus. How do you get the other two? Not exactly sure if you have to go all the way to the X on the map but that's what I did, , then I entered the bonus round and I found the largest chip prize (aka jackpot) and got the trophy straight away. You could probably earn it without going to the X, just gotta find the jackpot in the bonus round.